history that cannot be replicated by modern products. materials. What will you design? Many customers use reclaimed brick pavers and cobblestones to create stunning and timeless patios, driveways and walkways. That’s just the beginning—with some creativity, our historic materials are perfect for outdoor grills, driveway entrance columns, retaining walls, benches, landscaping features and more. In our ever-expanding inventory, you’ll find salvaged pavers, cobblestones, curbing and other hardscape materials—all at reasonable prices, ready to ship anywhere in the United States. Whether you’re replacing a tired driveway or restoring a streetscape, we’ll help you find the right color, era and character for your needs. We don’t just sell reclaimed materials—we buy them as well. Historic brick pavers, cobblestones, curbing, foundation stone and other hardscape materials are durable, impressive materials with long lives ahead. Help us reclaim their history, save them from landfill and find them new homes. Why Choose Experienced Brick & Stone? Every product is authentic, historic and reclaimed. No sealing is required. Pavers are naturally waterproof. You can earn LEED points with our green products. We also buy your used bricks, cobbles and stone. You’ll save an important piece of history from landfill. Our salvaged materials are delivered to you, on pallets, ready to use. In our ever-changing inventory, you’ll find the perfect material for your next project. Experienced Brick and Stone combines the allure of using 100-plus-year-old materials and creating something new, beautiful and durable. I purchased products from Experienced Bricks on two occasions and had good experiences both times. The first order was for Youngstown Tan bricks and they made a beautiful, organic, warm walkway. The second project was Medina Sandstone for driveway edging. The material has such a good, solid feel and historic look and was well stacked and packaged. It made a wonderful edging and added dimension and warmth to the driveway. Both deliveries went perfectly and were on time. I was also contacted to make sure everything was delivered as ordered and that I was satisfied with the product. I would highly recommend the products and service from Experienced Bricks. The stone arrived this afternoon. Thanks so much! They look great, cant wait to deal with you guys again. I appreciate you being so detailed oriented and responsive! We will definitely keep you in mind for the future. We own a 150-year-old historic farmhouse, and I wanted a product that would look as if it had been there 100 years. 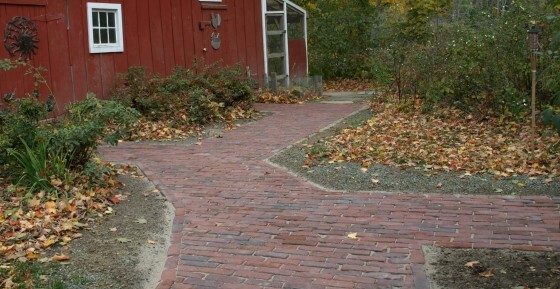 We did a walkway project in which we used Scott's Jamestown brick along with a cobblestone border. His service and professionalism was top notch. I would highly recommend his product. I purchased several pallets of reclaimed stone to use as a border in my garden and was very happy with the product. Dealing with the company was easy and Scott was always professional and courteous. Highly recommended! I ordered reclaimed sandstone curbing to use as steps for an 18th century home in New Jersey. The people at Experienced Brick were very helpful, sending pictures of the stones prior to purchase and shipping in a very timely manner. I also thought the price was very reasonable for both the material and the shipping. I would definitely purchase from them again. Experienced Bricks provided the pavers for our front walk. They originally were street cobbles from Olean, NY. It is really nice to have such history in our front yard. I think that this is a great business and finds homes for material that would otherwise be discarded and landfilled. I am very picky and drove the sales guy nuts, but it was all worth it. My walkway is awesome, charming and timeless. Doing business with Scott and EB&S has been a pleasure. George did a fantastic job showing us the available product and giving us some history and tips. Dawn also was very accommodating every time I called. Approximately 3 years ago we were in the market to acquire reclaimed cobblestone. After checking with several places we came across Experienced Brick and Stone, and after speaking with Scott Smith we looked no further because of his helpfulness and professionalism. His prices and products were above expectations, even if a problem occurs you are always updated regularly by him personally. He also makes suggestions for use, sends pictures, lets us know of other things available. We have used Experienced Brick and Stone for multiple projects. While we call our products reclaimed street brick pavers and cobblestones, others may call them repurposed street brick pavers and cobblestones. We've also heard them being called recycled street brick pavers and cobblestones. Then there are those who refer to them as used street brick pavers and cobblestones, antique street brick pavers and cobblestones ... and even salvaged street brick pavers and cobblestones! Remember, whatever "green" or sustainable phrase you want to use regarding street brick pavers and cobblestones, Experienced Brick and Stone has it.